Clear to partly cloudy. Low near 45F. Winds W at 5 to 10 mph..
Clear to partly cloudy. Low near 45F. Winds W at 5 to 10 mph. 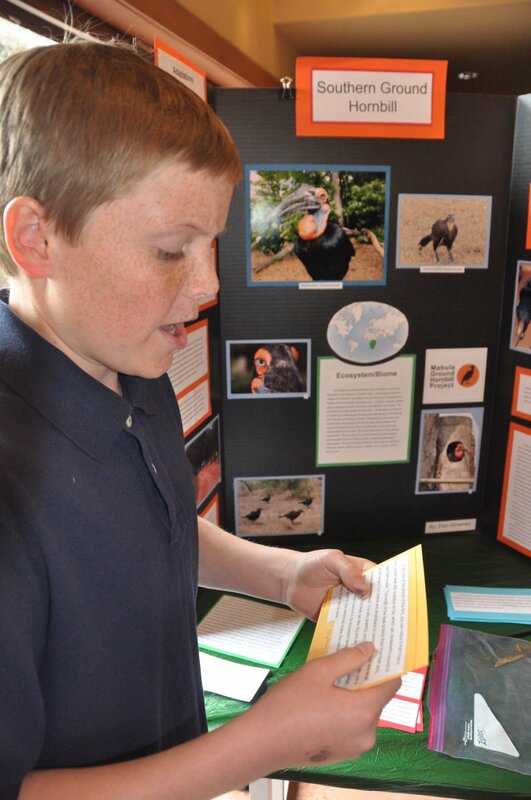 The Southern ground hornbill is an endangered species, according to Cheyenne Mountain Junior High School student Finn Growney, who gave a presentation Friday during an Endangered Species Day event at Cheyenne Mountain Zoo. Cheyenne Mountain Junior High School students, from left, Geneva Williams, Cate Roalstead, Owen McClain and, at far right, Noah Soyk, listen to a presentation on the reticulated giraffe during an Endangered Species Day event Friday at the Cheyenne Mountain Zoo. Cheyenne Mountain Junior High School teacher Laura Koselak, in orange jacket, discusses Cheyenne Mountain Zoo rules and regulations with parent chaperones prior to their assisting students with Endangered Species Day. Amani is a sweet-natured, 2,200-pound female reticulated giraffe that loves eating leaves, grazing in the savanna and attention from humans. The only problem is, Amani and her kind are in danger of extinction and have been placed on the endangered species list. Fortunately, Amani has friends in Cheyenne Mountain Junior High School students Owen McClain, Cate Roalstead, Noah Soyk and Geneva Williams who want Amani and her kin removed from the list permanently. To do this, students agreed to meet with and educate the public about these and other endangered animals, and what they can do to protect them from extinction. Participating in Friday’s, at Cheyenne Mountain Zoo provided students with an opportunity to educate more than 100 classmates and zoo guests about these endangered creatures. This year Endangered Species Day will officially be observed on May 17. According to the International Union for Conservation of Nature Red List, an endangered species is an animal most likely to become extinct. According to CMJH teacher Laura Koselak, fellow CMJH teacher and zoo board member Amy Bales adapted animal projects designed to support the zoo on their Endangered Species Day and combined it to meet current Colorado Science Standards. “Students are excited because they want to tell the community how they can help protect these creatures,” Koselak said. Regrettably, the biting chill forced students to conduct their presentation indoors and away from some of the endangered critters. The last-minute decision didn’t discourage students who led learning stations and presented dioramas, games and newscasts designed to educate peers and the public about the plight of 24 endangered species. The Amur tiger, black rhinoceros, Goeldi’s monkey, reticulated giraffe and Southern ground hornbill were among the endangered species discussed. Student presenter Sumner Davis said educating the public is what the event is all about. “I think I am making a difference by bringing awareness about the (Amur) tigers’ endangerment,” Davis said. “I wasn’t familiar with the African lion before I got involved with this project. Now, I am having fun sharing information with the public,” said student presenter Tyler Roberts as he read from a handful of type-written note cards. Through their participation, students met common core state standards, engaged in cross-curriculum collaboration, refined scientific argumentation, and honed their communication and presentation skills. The Matschie’s tree kangaroo group — Andrew Beyers, Lila Blees, Maddy Huebner, Samantha Niedzwiecki, Kirsten White — were recognized for their visitor interaction skills and presentation changes to match attendees’ age and comprehension level. Ella Dorpinghaus and Nicole Jones also earned kudos for their newscast presentation on the African lion, with Jones serving as a news reporter and Dorpinghaus in a lion costume. Presenters also received extra credit for their work. CMJH has participated in Endangered Species Day since 2013, Kosalek said. Students started the ecology unit in February and even presented their projects to classmates. “Students put a lot of imagination went into these presentations, so this is a big day for them,” Koselak said. Following the presentations, students visited with some of the zoo’s other residents. “Some (students) fed the naked mole rats, one wanted to know if the male gorilla always looked mad and another, who is terrified of snakes, had to present with a huge python behind her and said after a while she wasn’t scared anymore,” Koselak said.